Since I posted my Summer Skincare Shake-up back in July I’ve once again (although unintentionally) given my routine a makeover. Over the summer I fell in love with Merumaya’s Melting Cleansing Balm, as I mainly loved the idea of dispensing the product out of a tube instead of dipping fingers into a pot (ick). It fast became a favourite of mine, but I was gradually put off by the scent and wanted to switch it up once I’d ran out. My sister had mentioned a couple of months back that she’d been trying out the REN Rosa Centifolia No. 1 Purity Cleansing Balm, and during a Google shortly after I noticed this one was again in a tube (yay) so it had to be next on my shopping list. REN has a pretty good reputation when it comes to skincare, and after a skim read of a few rave reviews I thought I’d give it a go. The pros: I adore the rose infusion, as it not only smells lovely but amalgamates as a relaxing, soothing and calming scent.The texture is thick enough to still act as a balm rather than a runny milk consistency, giving plenty of coverage with little wastage. Most importantly, it cleanses well, removing makeup and leaves my skin without any redness. Bar the cons, this is another lovely cleansing balm that I enjoy using night after night. Once the cleansing is done, it’s on to toning. I’m still loving La Roche Posay’s Serozinc, of which I reviewed in my last skincare post. However I would love to try the Pixi Glow Tonic next; it’s been on my skincare wishlist for years. If you’ve tried it, please let me know below! A couple of months ago, once I’d finished using the summer-perfect moisturiser Hydraluron Moisture Jelly, I rummaged around in my basket of beauty products and found Benefit’s Triple Performing Facial Emulsion; I’d picked this up as part of a gift set in the Boots Boxing Day sales and as it had been tucked away all year I thought I’d give it a go before buying anything else. I’d already been using Benefit’s It’s Potent Eye Cream for several months and rated it, as the consistency is generous but neither thick nor runny, feels lightweight and sinks into the skin nicely. The same can be said for the Facial Emulsion; as I have combination skin only a couple of pumps are needed as too much can make it difficult to sink in and can feel a little greasy. As this moisturiser contains SPF it may give the skin a slight sheen, but that is easily combated with a mattifying primer or powder. My skin is very sensitive, so its floral scent was rather off-putting to begin with, however, as with all new products, once I’d broken out slightly my skin quickly returned to normal. It’s been happy days since then. Plus, the cute packaging gets brownie points; the glass bottle looks very chic. Now for the twist! I’d been in the market for a new face tanner, and was on the hunt for Bondi Sands Everyday Tanning Milk for Face. 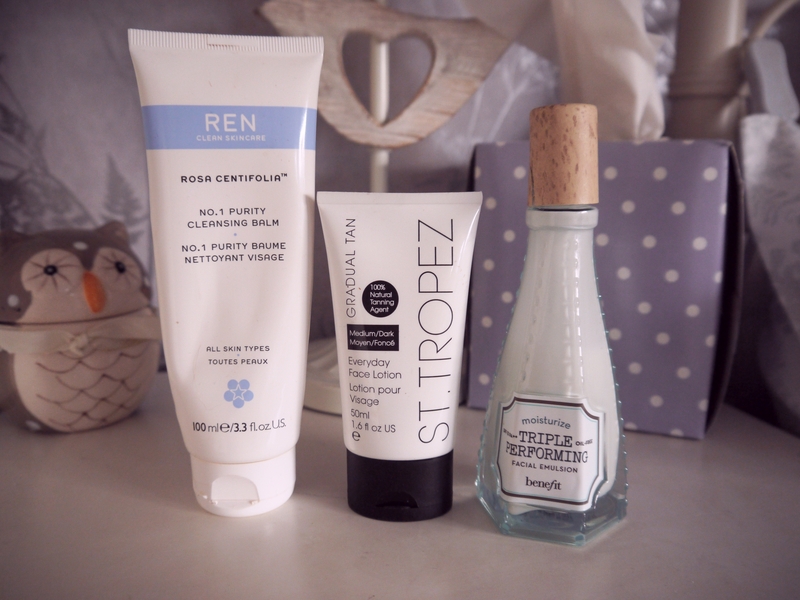 I was peeved when I couldn’t find it in Superdrug, so I opted for St. Tropez Everyday Gradual Tan for Face in Medium/Dark instead. Surprisingly, with the amount of experience I have in the fake tanning department, I have never tried a St. Tropez product. This one, I love. First off, it smells lovely. Secondly, it looks and feels just like a normal moisturiser, therefore application is a doddle (just make sure to wash the hands after…), and thirdly, the colour pay off is a healthy glow. It doesn’t turn you too light or too dark, and daily application gives you the option of going darker. I apply it just once or twice a week to give my skin the shade I want (with no streaks). On those days, I’ll apply it of an evening instead of using my every day moisturiser. Touch wood, it hasn’t given me a break out yet. So that’s it for my new skincare additions! Have you tried out any of the products mentioned?